Like a small tributary becomes a mighty river a little boy in a canoe paddles his way to the ocean to become a man. Loud as bullfrogs and influential as Gandhi, Pipe Babies are a force to reckon with. Smuggling does not always involve automatic weapons or munitions of war. Smuggling can mean a chocolate chip cookie. Once Was Enough: From South Africa to Mozambique. If you were approached by a mysterious woman, claiming to work for world unity, and asked to fly political refugees out of Apartheid South Africa would you go? Here is the story of one Canadian bush pilot who did! Float flying in the Niger River Delta. 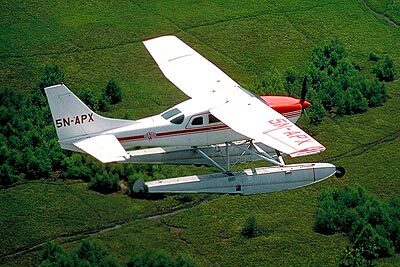 The story about flying a Caravan in West African was originally written for the Cessna Caravan News, (Vol. 10, No.3 Summer 1996.). You may have already seen the edited version in the newsletter. Virtual Horizons will now bring to you the full unedited version as it was intended to be published, with some extra photos thrown in for good measure. A flying boat captain recounts the trials of ferrying a PBY Catalina up the backbone of Africa. From South Africa to Saudi Arabia in four grueling but memorable days. Mark & Delia Owens used their bush planes extensively to monitor African wildlife and actively stop poaching. Read what happens when you cross the thin line between flying for a living and flying for life. Braving a solo existence in the sky, bush pilots are often the adventurers that link the lonely inhabitants of distant lands. Soaring above the few wild places left on our planet - across endless deserts, tangled jungles, jagged mountains, treacherous plains of ice - these unique pioneers serve as communication links for their "neighbours" residing in desolate regions. In December 1990, bush pilot Tom Claytor set off from Philadelphia, USA on a journey. He is attempting to fly around the world via all seven continents to visit the wilderness. The pilot Charles Lindbergh believed that man could learn the most from "the wisdom of wilderness". Cessna 206 over an African Delta. Last modified on May 09, 2011 .